Click on the instrument in the above picture to go to the page for that instrument. Even before President Truman signed the legislative act that created our modern civil defense program (January 12, 1951), the national need for special radiological instruments for civil defense had been recognized. In December 1950, letters signed by James J. Wadsworth, an official in the Executive Office of the President, had been sent to State Governors encouraging them to obtain such instruments. The Federal Civil Defense Administration (FCDA) offered to pool the State orders to obtain more favorable prices through procurement in quantity. The National Bureau of Standards (NBS) had agreed to make tests to ensure the quality and correct calibration of the instruments purchased. All procurement costs were to be the responsibility of the States. Testing and calibration costs would be borne by the NBS. North Korea had invaded South Korea the previous June, and U.S. combat forces were actively engaged in battle on the Korean peninsula. Further, our relations with the Soviet Union, which was known to possess nuclear weapons, were strained. Nevertheless, the States were not responsive, and no procurement was undertaken. As a next step, the FCDA worked out an arrangement with the Atomic Energy Commission (AEC) whereby AEC instruments and small radioactive sources were loaned to the States for training. While many of the States took advantage of this program, they recognized its deficiencies. After the initial training, the instruments had to be returned, leaving no capability for refresher training or for radiological monitoring in the event of an emergency. This was somewhat like training soldiers with wooden guns but never providing the real ones. Subsequently, the augment the AEC supplies, FCDA purchased some low-range Geiger counters (later known as the CDV-700s). Certain States, notably New York and California, initiated limited procurement actions to obtain operational instruments. But by and large, the need for such equipment went unmet. Finally, it was recognized that the policy of depending on the States to provide their own radiological monitoring equipment simply would not work. The FCDA and Congress accepted that the Federal Government must assume responsibility for the radiological instrument program including design, engineering, procurement, and maintenance and calibration. A CDV-700 Low-Range Radiological Survey Meter, Geiger Counter, probe type, beta-gamma discriminating, 0-0.5, 0-5, and 0-50 mR/hr.  A CDV-715 High-Range Radiological Survey meter, beta-gamma discriminating, with a range of 0-5, 0-50, and 0-500 R/hr.  A CDV-730 Radiological Dosimeter, Self-Reading gamma only, 0-20 R.
 A CDV-750 Radiological Dosimeter Charger. In the early 1960's, the Department of Defense's Office of Civil Defense (OCD) embarked on a program to locate and stock naturally occurring fallout protective space in existing buildings. Included in these stocks were radiological instruments. In May 1964, OCD announced the availability of shelter instruments. For shelters meeting the specified criteria, assembled "Shelter Radiation Kits" were provided. Each kit contained one CDV-700, one CDV-715, two CDV-742s, and one CDV-750. Other specified requirements were identified, and appropriate instruments were designed and procured. 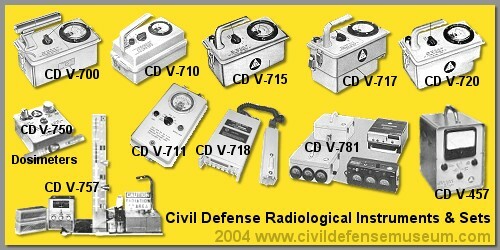 These instruments included the CDV-700M for radioiodine measurements, the CDV-717 for remote readings, the CDV-138 for training, the CDV-781 for aerial surveys, and the CDV-711 for external readings from a hardened site such as an emergency operating center (EOC). A chronological account of radiological instrument procurement is shown in Figure 5. It does not include procurement of radioactive source sets used in training.  One set of monitoring instruments for each of 150,000 stations.  A second set of monitoring instruments for each of 50,000 stations.  One kit of monitoring instruments for 200,000 shelters.  2.4 million dosimeters for emergency workers.  1,500 training sets (150,000 instruments).  14,510 high school monitoring kits (160,000 instruments).  1,250 aerial survey meters.  200 remote blast-resistant survey meters for EOCs. The above information was taken from FEMA publication CPG-3-1 published in 1986. The FEMA CPG 3-1 also has a interesting list of how many of each type of instrument were originally procured. Below I have put together a version of list with the most common instruments. Here is a approximate comparison between the scale ranges of a CD V-715 and CD V-700. Keep in mind this is an approximate comparison because the CD V-715 and CD V-700 detect radiation in different ways. I used the CD V-715/17 because they have a x.1 range on them where the CD V-710/20 meters lowest range is x1. 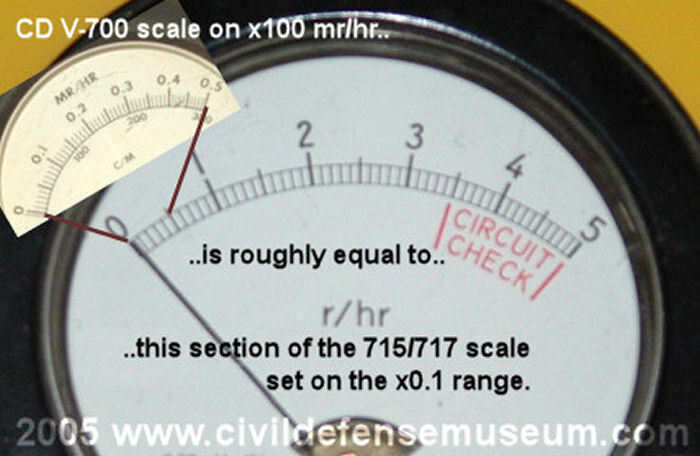 The second example below showing the x1 scale would apply to the CD V-710/20 as well as the CD V-715/17. I put this together primarily for those who are interested in these old instrument as collectors or for preparedness uses. The high-range CD V instruments are referred to incorrectly, the majority of times, as Geiger counters by those who are trying to sell them. Here are two examples showing the extreme differences in scale range readings of the instruments. CD V-700 on x100 range compared to CD V-715 & 717 on x0.1 range. The entire CD V-700 scale range (inset in photo) set on the x100 range (highest range for the CD V-700) is 0 to 50MR/HR roughly equal to the first 5 scale divisions on the CD V-715 or CD V-717 meter scale (large scale in photo) when set on the x0.1 range (lowest setting on the CD V-715 or CD V-717) which is 0 to .5 r/hr. Since 1 R = 1000 mr the CD V-715/17 scale when set on .1 is equal 500 mr/hr or ten times the total scale range of the CD V-700. CD V-700 on x100 range compared to CD V-715 & 717 on x1 range. The entire CD V-700 scale range (inset in photo) set on the x100 range is roughly equal to one half of the first division on the CD V-715 or CD V-717 scale (large scale in photo) set on the x1 range. Since 1 R = 1000 mr that would make each small division of the CD V-715/17 when set on the x1 range equal to 100 mr/hr which is double the CD V-700s 50mr/hr range. This comparison really shows the extreme difference in the CD V-700 and the CD V-715/717s.